Bacteria are all around us and they love the food we eat just as much as we do. Taking a few simple steps between the store and the dinner plate can prevent a wide range of food-borne illnesses. Following are some tips and best practices for handling meat and poultry. When purchasing meat in the grocery store, be sure to visit the meat department last. This will minimize the amount of time that the meat is unrefrigerated between purchasing and arriving home. Bacteria grow and multiply rapidly at temperatures between 40 and 140 degrees Fahrenheit (the temperature "danger zone"), so the amount of time spent between these temperatures should be minimized. Keep meat and poultry separate from other items in your grocery cart. Packaging is not always tightly sealed and bacteria-filled juices may leak during transport. Preventing meat and poultry packaging from touching other items in your grocery cart, especially fresh produce, reduces cross contamination and the likelihood of food-borne illness. Refrigerate meat and poultry immediately upon arriving home. Once again, minimizing the amount of time that food spends in the temperature danger zone greatly reduces the risk of bacterial proliferation. Meat and poultry should always be thawed at refrigerated temperatures (40 degrees or lower) and never at room temperature. Thawing in the refrigerator may take longer, but it ensures that all parts of the food remain out of the temperature danger zone during thawing. Thawing meat and poultry at room temperature may allow the surface (where most of the bacteria resides) to warm up quickly while the inside remains frozen or at safe temperatures. Bacteria can then multiply rapidly on the surface as the meat thaws and cause infection. Meat and poultry can also be thawed under cold running water. Cold running water will keep the exterior of the meat within the temperature safety zone while the interior thaws. The microwave can also be used to thaw meat and poultry, but this method should only be used if the meat is cooked immediately after thawing. Microwaves tend to heat unevenly and can produce warm spots perfect for bacterial growth. As long as the meat or poultry is cooked immediately after microwaving, the bacteria will not have time to proliferate on these warm spots. Meat and poultry should not be washed prior to cooking. Washing increases the likelihood that bacteria will be splashed onto the surface of your sink, countertop, or other cooking surfaces and cause cross-contamination. Any bacteria on the surface of meat or poultry will be killed during the cooking process (if cooked properly) and does not need to be washed off. Washing food is most important for those items that will be consumed raw. Marinating meat and poultry should always be conducted at refrigerated temperatures. Allowing meat and poultry to marinate at room temperature provides bacteria the perfect conditions for growth. Even marinades that are highly acidic allow the growth and proliferation of specific types of bacteria. Marinade used or exposed to raw meat should never be applied to meat after cooking. If needed, separate a portion of the marinade prior to adding the raw meat to keep it bacteria free and safe for use after cooking. Meat should always be cooked to the proper temperature to kill harmful bacteria. 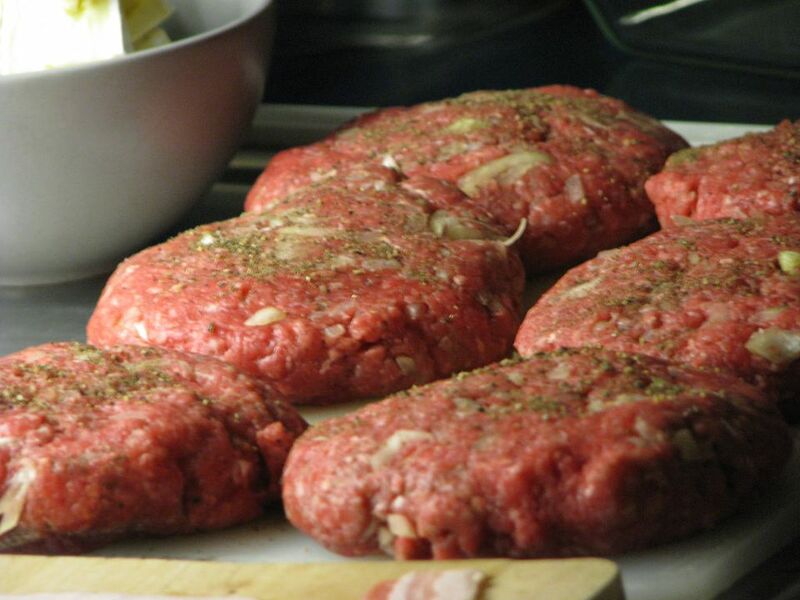 Ground meat, such as hamburger, should be cooked to the proper temperature both inside and out. Whole cuts of meat should be cooked to the proper temperature on the surface or other areas that may have been exposed to bacteria. Generally, if not cut open, bacteria does not have access to the interior of solid cuts of meat. Refer to minimum safe internal cooking temperatures for more information. After cooking, meat and poultry should be refrigerated as soon as possible. The less time spent in the temperature danger zone of 40 to 140 degrees, the less chance of infection. Meat and poultry should not be left to cool at room temperature prior to refrigeration. Refrigerators are made to compensate for the increase in temperature when warm items are placed in them. Although most bacteria are killed during the cooking process, they are quickly reintroduced from the environment after cooking. Cooked food left to stand at room temperature provides the perfect breeding ground for bacteria. Cooked food held at room temperature is more at risk for bacterial proliferation than their raw counterparts. Placing items in the refrigerator as soon as possible after cooking is one of the most important steps in food safety.